This is Page 2 of a nine-page article. Click on the black links below to visit other pages. Most vanilla beans are used to make vanilla extract, the most commercially available vanilla product. But other vanilla products are equally wonderful to use in cooking and baking. You’ll learn about them in this glossary of vanilla terms. 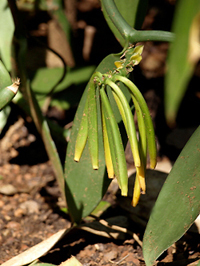 One of the first places that Mexican vanilla (Vanilla planifolia) was planted was on the Indian Ocean island of Le Réunion. Previously known as Bourbon Island (Île Bourbon) after the French dynasty, it was renamed La Réunion in 1793, following the fall of the Louis XVI of the House of Bourbon, in the French Revolution. Today, vanilla from the islands in this area of the Indian Ocean, off the east coast of Africa, is known as Bourbon Vanilla or Madagascar Bourbon vanilla, and the islands collectively are known as the Bourbon Islands. The island of Madagascar, shown in red, is the world’s largest producer of vanilla; the specks to the north of Madagascar are Comoro and Seychelles (Republic of Seychelles). The speck to the right of Madagascar is Le Réunion. Bourbon vanilla has no relationship to bourbon whiskey. See also Madagascar Vanilla. Photo of Madagascan vanilla beans from Aust & Hachmann by Claire Freierman | THE NIBBLE. 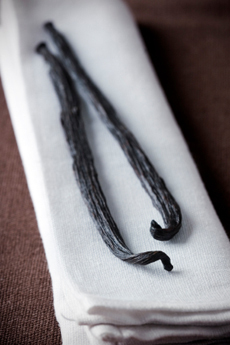 Vanilla beans must be cured after harvesting to develop their aromas and flavors. Different methods of curing are used in different countries. The beans are left in the sun each day to dry, then wrapped in blankets and taken indoors to “sweat” at night. This process happens daily for five to six months; it engenders a naturally induced enzymatic action where the glucovanillin inside the thousands of tiny seeds in each pod, is converted to to glucose and vanillin. It is here that the fermenting vanilla pods take on their flavor and aroma (vanillin aroma is the dominant flavor characteristic of vanilla). The cure is critical to producing good vanilla: Climatic conditions, the timing of the harvest, and the extent of sweating by the pods during curing, among other factors, will determine the vanillin content and thus the quality of the cured pods. Well-cured beans, packed in airtight containers, can keep their qualities for a long time. During the curing process the green bean-like pods are converted into the dark, familiar dried vanilla pods. Photo by Alan Lagadul | IST. 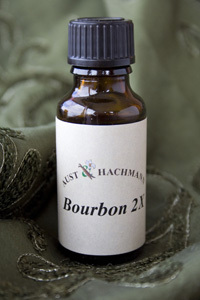 Photo of Aust & Hachmann 2x Bourbon vanilla extract by Claire Freierman | THE NIBBLE. 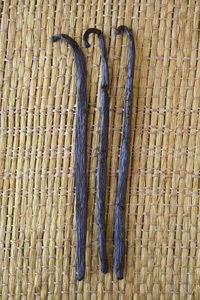 Cured vanilla beans are graded according to their length of beans, aroma, color, flexibility, luster, and overall health (freedom from blemishes, mildew and insect infestations). 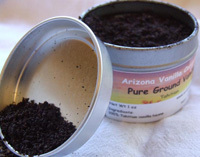 Ground vanilla is made from scraped vanilla bean pods that have been dried and processed. Ground vanilla beans are a substitute for vanilla extract and are used, among other things, to leave bean “specks” in the recipe. Ground vanilla beans are very fragrant and have twice the potency of vanilla extract, so half as much is needed in a recipe. These are the black specs you see in many ice creams and other vanilla-flavored products. Artificial vanilla flavoring is often labeled “imitation vanilla extract.” However, it can also be called vanilla essence, a confusing term, since vanilla essence is properly the flavor extracted from real vanilla beans. If you see a product called “vanilla essence,” look at the ingredients label to determine if it is artificial vanilla extract. Imitation vanilla is made from artificial flavorings, most of which come from wood byproducts, and often contain chemicals. 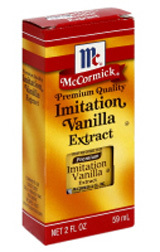 Imitation vanilla has a harsher quality than pure vanilla extract; some find that it has a bitter aftertaste. In recipes, twice as much imitation vanilla flavoring is required to match the strength of pure vanilla extract. Most imitation vanilla flavorings or extracts today are actually byproducts of the paper industry. Lignin, an indigestible compound of wood is used in conjunction with synthetic vanillin and colorings like coal tar, red, and caramel dyes to create a product that appears and smells just like real vanilla extract. The taste, however, is indisputable— bitter and chemical. And if that weren’t bad enough, the U.S. has had to ban the importing of artificial Mexican and Caribbean vanilla extracts containing courmarin—a toxic carcinogen with a similar taste to vanilla. An astonishing 97% of all vanilla products are synthetic. Artificial vanilla has been around since the late 19th century. Vanilla planifolia was also planted in Indonesia, which has become the second largest producer of vanilla in the world, after Madagascar. However, the terroir does not produce a quality vanilla: It is woody, astringent and phenolic.